New Zealand Pinot Noir: Hot or Not? Noted UK wine writer Jamie Goode recently tweeted, “Bold statement: within 10 years New Zealand could be known for making the world’s consistently best Pinot Noir and Syrah.” The latest figures show that New Zealand is now exporting well over one million cases of Pinot Noir a year and in all markets outside of the United States, New Zealand Pinot Noir ranks second only to Burgundy in sales. New Zealand Pinot Noir is hot. Maybe not. The Wall Street Journal (Lettie Teague, September 1, 2012) recently offered an article titled, “What Happened to New Zealand Pinot Noir? Teague points out that she has noticed less New Zealand Pinot Noir on this country’s wine lists and retail store shelves and attributes this to a number of factors including loss of distributors during the recession of 2008-09, the unfavorable exchange rate which keeps prices relatively high, and poor brand recognition outside of a few high profile labels. My personal experience with retailers in California is that the showpiece New Zealand Pinot Noirs from recognizable wineries such as Ata Rangi, Cloudy Bay, Craggy Range, Escarpment, Felton Road, Peregrine, Pyramid Valley, Quartz Reef, Rippon, and Spy Valley still appear regularly in fine wine retailers stock, but some bottles languish on the shelves for extended periods, and retailers do not push the wines using featured tastings or publicity. New Zealand Pinot Noir just doesn’t seem to generate much buzz currently among stateside wine connoisseurs because the competition from California and Oregon Pinot Noir is formidable. The New Zealand Pinot Noirs simply don’t offer enough of a distinct contrast to North American Pinot Noir to make them preferable. New Zealanders such as writer Geoff Kelly have been critical of New Zealand Pinot Noir, pointing out that a noticeable number of his country’s Pinot Noirs lack body and concentration, something the American palate cherishes, too many are either under-ripe or overripe or exhibit flavors of both, and some wines can be overwrought with acidity, something American consumers generally disdain. 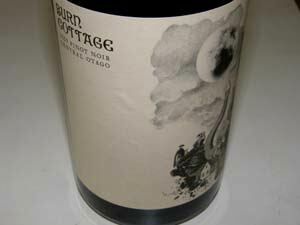 That said, I try to taste New Zealand Pinot Noir periodically out of curiosity, and over the years have acquired quite a fondness for the Pinot Noir from Felton Road, Rippon, and most recently, Burn Cottage. A few wines primarily from the excellent 2010 vintage that I tasted recently are reviewed here. Some producers in New Zealand have claimed that 2010 is the best ever for Pinot Noir in that country. 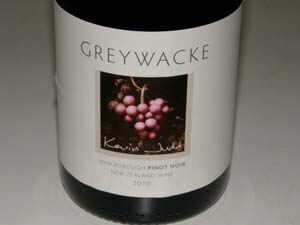 Many New Zealand producers of premium Pinot Noir are committed to screwcap closures. 14.0% alc., 1,136 cases, $50. Imported by Classic Wines LLC, Denver, CO. Estate grown and bottled by the American Sauvage Family in Cromwell. Consulting winemaker and partner is Ted Lemon of Littorai. · Moderately dark reddish-purple color in the glass. Deep, penetrating aromas of chocolate covered black cherries, compost, slate and seasoned oak. Intense mid palate attack of ripe black raspberry and black cherry fruit backed by supple tannins, finishing with some length. An earthy, mineral underpinning adds interest and complexity. Highly flavorful, but elegantly styled. Very good. 13.7% alc., $50 (sold out at winery). Imported by Classic Wines LLC, Denver, CO. · Moderately dark reddish-purple color in the glass. Shy initially, picking up interest and intensity over time in the glass to reveal enticing aromas of dark red fruits, exotic spices and forest floor. Good attack of tasty black cherry, dark red raspberry and dark plum fruit supported by firm, ripe tannins and lifted with bright acidity. Very juicy and pleasing, becoming more intense over time in the glass. Flat-out great the next day from a previously opened and recorked bottle, showing a slip of its true potential including a marvelous peacock tail grand cru finish. 14.0% alc., $35, screwcap. Imported by Kobrand Corp, NY, NY. Indigenous yeast fermentations, aged more than a year in French oak barrels without racking. · Medium reddish-purple color in the glass. Slight reduction and oaky upon opening, becoming very savory over time with aromas of bramble, herbs and wild, dark red berries. Fruits in the redder spectrum are featured with a green, herbal tone. Moderately light in weight with supple tannins and an acid-driven, juicy finish. Good. 14.0% alc., $40, screwcap. Imported by Wilson Daniels, St. Helena, CA. 100% organic and biodynamic viticulture. 20% whole cluster. Wild yeast fermentations, aged 11 months in French oak barrels, unfined and unfiltered. · Moderately dark reddish-purple color in the glass. Aromas of black cherry liquor, black raspberries, blackberries and oak toast. Moderately rich with impressive mid palate presence, a seductively plush mouth feel, and a lengthy finish featuring black raspberry fruit. Oak plays a supporting role and the tannins are well-managed. The most impressive features are the soft, polished texture and the impressive concentration of the fruit. 14.0% alc., pH 3.65, TA 0.56, $35, screwcap. Released February 2012. This winery is named after New Zealand’s prolific bedrock and the label displays the name of proprietor Kevin Judd, one of Marlborough’s pioneering winemakers. Fruit is sourced from mature vineyards within the central Wairau Plains and the Southern Valleys. Predominately Dijon clones 115, 777 and 667, with smaller amounts of Pommard and AM 10/5. Most of the fruit was de-stemmed with some whole bunch inclusion. Indigenous yeast fermentation, hand punch downs, aged in 45% new French oak barrels for 15 months and fined for clarity before bottling. The wine is made at Dog Point Winery in the Brancott Valley. Imported by Old Bridge Cellars, Napa, CA. · Medium reddish-purple color in the glass. Nicely perfumed with aromas of dark berry jam, spice, forest floor and a hint of black cherries. Earthy with flavors that echo the nose, becoming richer and more enticing over time in the glass. Silky, with soft tannins and a good cut of acidity on the finish. Still fine the following day from a previously opened and re-corked bottle. Very good and worth seeking out. 14.0% alc., $27, screwcap. Imported by Nedrac Inc., Palm Desert, CA. Winemaker is Grant Taylor. · Moderately dark reddish-purple color in the glass. Very ripe aromas of raisin, black plum and dark chocolate. Dark, earthy, ripe fruits are featured, highlighted by citrus-laden acidity that persists on the finish. The acidity brings the wine freshness, but is a bit imposing. Decent. 13.5% alc., $14, screwcap. Imported by Winesellers LTD, Niles, IL. Owners Neal and Judy Ibbotson have a relative who was a vicar in the Anglican Church. On a visit to Saint Clair, the vicar selected his favorite barrels and the name was born. The winemaker is Matt Thomson. · Moderately light reddish color in the glass. Fresh aromas of dark red strawberries, raspberries and cherries. Fruit-driven, featuring red fruits with complimentary oak in the background. Elegantly styled and smoothly textured with mild tannins and a grapefruit-peel note on the finish. A relatively straightforward drink that offers value. Good.